Here’s a meal that hits close to home. Growing up, my mom and dad always cooked dinner for my sisters and I, which I realize now is astounding considering how busy they were! And naturally, growing up, as kids we want to help. Whether it be mixing something in a bowl, setting a timer, or measuring out ingredients, we made sure we were the best mixers, setters and measures around. Now, one of the things my parents always let me and my sisters do was mash beans, mainly because there was little chance of a spill and no sharp objects involved. And so, that is the inspiration for the following, simple and delicious recipe. Now, all you’re going to have to do is get your tostadas and lay them out (you can even make your own!). Next, you’ll take out a frying pan and pour the beans into it while heating them up on a medium temperature. Then, take a bean masher and, simply mash the beans. Once the beans have been cooked (for about 5-10 minutes), you’ll just take as much beans as you’d like and spread them out over the tostadas. Additionally, one of the great things about beans are their health benefits. And finally, all that’s left to do is add whatever toppings you’d like: cheese, meat, avocado, lettuce, tomatoes, the world is your oyster! 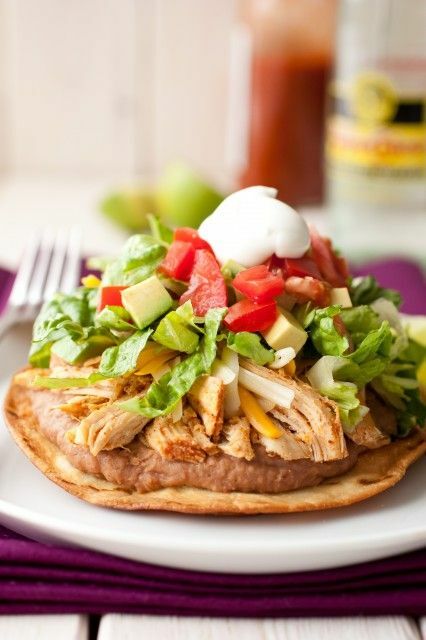 If you’re looking for some more creative ideas, check out this article: Tostadas Can be Topped with Anything. So, there you have it. This is an incredibly simple meal that you can make on any day of the week and, if you want to get others involved, it can be a fun meal to make together! Hope you enjoy, and feel free to share how the recipe goes for you.